The Acoustic Doppler Current Profiler (ADCP) is regularly used to measure streamflow in high-flow situations when water is too deep and fast to wade. In these situations, the ADCP can provide accurate detail about flow, as well as the channel geometry. For example, on February 21st, 2017 Coyote Creek flooded throughout areas in San Jose. 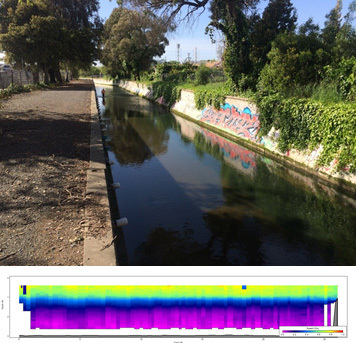 Balance collected streamflow data on Coyote Creek at Charcot Ave in San Jose. The graphic shows the channel geometry and the associated water velocity, which corresponds to a flow of approximately 5,945 cfs. The corresponding photo shows imminent flooding across the road. In tidal situations with varying water densities and directional flows, the ADCP can accurately measure streamflow. 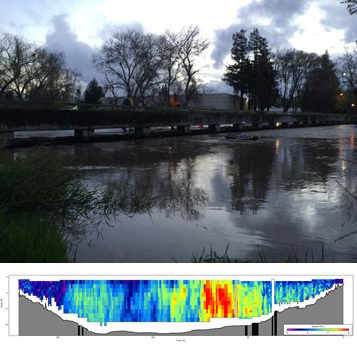 Balance collected streamflow data along the P-line channel in Alameda County, which is tidally influenced. The data in the graphic was collected during high tide. The velocity stratification shows that the denser salt water sinks to the bottom of the channel and is moving very slowly, compared to the fresh surface water. The ADCP can be used to survey bathymetry, which is particularly useful in understanding the topography of ponds, lakes, or channels. Balance collected bathymetric data from three ponds in Bear Creek Redwoods Preserve to develop stage-storage relationships and to evaluate available habitat for sensitive species. Balance has also used the ADCP to determine the channel depth and geometry during emergency back repair construction. © Balance Hydrologics. All Rights Reserved.